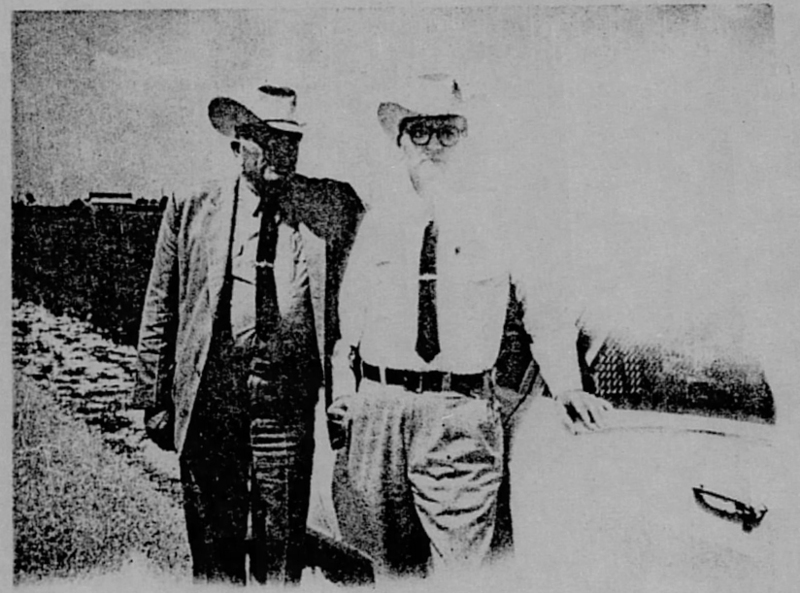 On Friday, September 3, 1965 at 11 p.m. Brazoria County Chief Deputy Sheriff Billy E. McCoy and Deputy Sheriff Bob Goode of Angleton, Texas were patrolling the West Columbia area of Brazoria County (South of Houston), on Highway 36 between West Columbia and Damon. McCoy spotted a brilliant purple glow at horizon level beyond vast pasture land and was unable to identify the source. The deputies headed south with Goode driving and McCoy to the driver’s right. The object was off to their left. The glow soon became discernible as a bright, round light. Next, McCoy noted a somewhat smaller less powerful blue light seemingly “emerge” from the larger purple light and move some distance to its right. He later realized this effect resulted from the triangular object making a 90-degree turn so that it “faced” them, and the blue light, which had been parallel with and “behind” the purple one, now became visible. Goode had maintained until this time that the lights were oil field lights, but McCoy disagreed. McCoy then noticed that both lights had apparently risen simultaneously slightly above the horizon level, and Goode then conceded that the objects could not be oil field lights. Goode swung the car around for a better view as they were now directly opposite the light, with McCoy, the passenger, now on the side closest to the pasture. 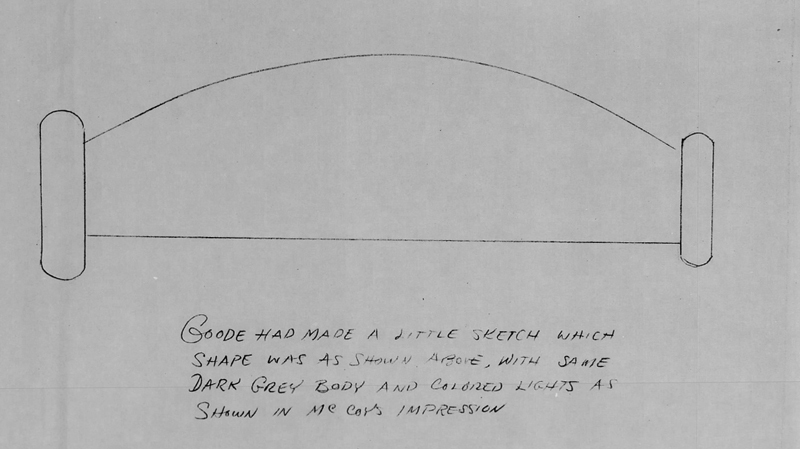 Based on knowledge of the terrain and upon further investigation in daylight, McCoy and Goode estimated that the object at this point was 5 to 7 miles from the highway. 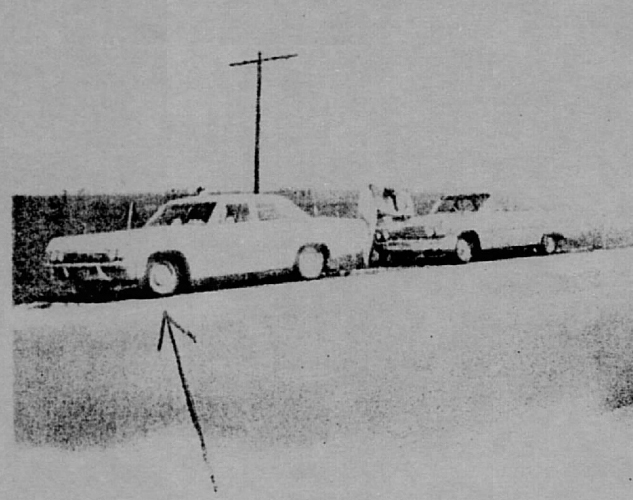 McCoy feels certain that within the next three or four seconds, after the car was turned around, the object traversed the distance from its initial position to a spot approximately 150 feet from the highway, 100 feet above the ground level, and parallel to their car. The two patrolmen made a break for it with the object almost directly overhead. Driving at speeds of up to 110 mph, they finally found themselves free of the object. As they fled the scene, they could see the object maneuver back to its original position in the old fields. After gaining their composure, they decided to return to the scene. Arriving at the spot where they first saw the object, they observed the object begin the same routine as before. Frightened, they sped away. 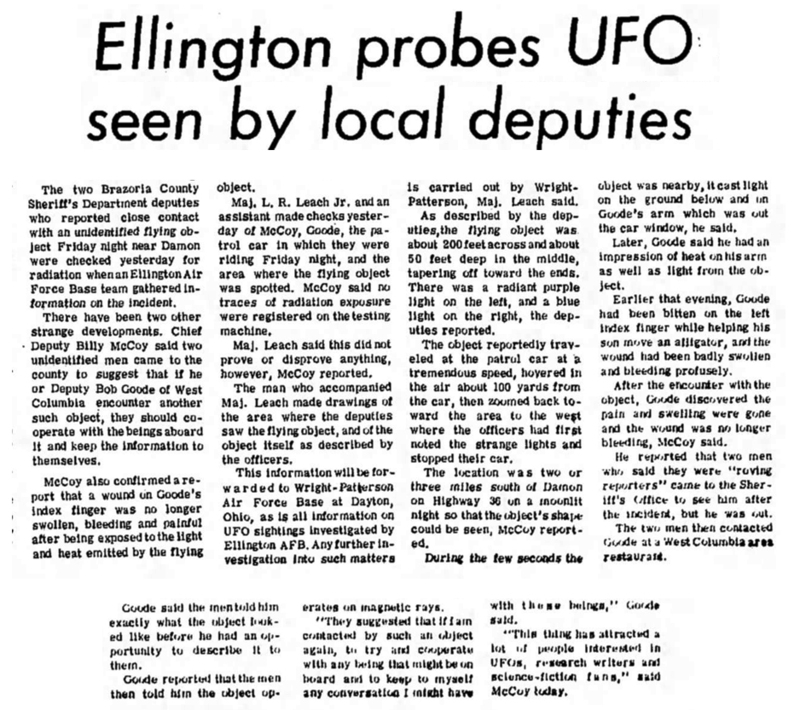 There has been no explanation for what the two patrolmen saw that night, but on an interesting side note, this case occurred on the same night as the celebrated UFO Incident in Exeter. Deputy Sheriff Goode and I were driving south on Highway 36 from Damon, Texas toward West Columbia at about 11:00 p.m. on Friday, September 3, 1965. When we were about two or three miles south of Damon, I saw a very bright purple light stationary on the horizon about 5-6 miles away and southwest of our position. After a few seconds a smaller blue light appeared out of the larger purple light and traveled to the right of the purple light, pausing momentarily in two distinct positions before becoming stationary. The lights then floated upwards to an angle about 5-10 above the horizon. They remained at a distance of 5-6 miles and we were unable to distinguish any other features other than the two bright lights. We turned the car around and Deputy Sheriff Goode looked at the lights through binoculars. We decided to investigate further and headed back toward Damon to look for a back road to take us nearer the lights. After traveling about 3/4 of a mile on Highway 36 we slowed down. Goode had his window open (rolled down) and looked through the binoculars again and the lights appeared to still be in the same position. We slowed down to almost a stop off the edge of the highway and while watching the lights they started coming toward us at a rapid speed. The object came up to the pasture next to the highway about 150 feet off the highway and about 100 feet high. The bulk of the object was plainly visible at this time and appeared to be triangular shaped with a bright purple light on the left end and the smaller, less bright, blue light on the right end. The bulk of the object appeared to be dark gray in color with no other distinguishing features. It appeared to be about 200′ wide and 40-50 feet thick in the middle, tapering off toward both ends. There was no noise or any trail. The bright purple light illuminated the ground directly underneath it and the area in front of it, including the highway and the interior of our patrol car. The tall grass under the object did not appear to be disturbed. There was a bright moon out and it cast a shadow of the object on the ground immediately below it in the grass. Deputy Sheriff Goode was in the driver’s seat with his left arm laying in the open window. Although he was wearing a long sleeved shirt and a coat, he later said that he felt the heat apparently emanating from the object. We immediately put the car in motion and headed toward Damon as fast as we could go. While traveling at speeds up to 110 mph, toward Damon, continued to watch the object out of the back window of the car. It appeared to remain in the same position for approximately ten seconds and then move off in the direction where we first saw it at a very high speed. There was no noise. While it was in motion the smaller blue light on the right side disappeared entirely and the larger purple light became smaller but retained its brilliance apparently caused by its movement away from us. After arriving at approximately its original position, it went straight up in the air and disappeared at 25-30 above the horizon. When we got to Damon, we drove slowly through the town, discussed what we saw, and decided to go back to the area and see if the object was still there. We were both scared but still wanted to find out what it was. We decided to take the old Damon-West Columbia road which would put us closer to the area where we first saw it. However, we traveled the full length of this road until we turned off to go back on Highway 36 and we didn’t see anything. We headed back toward Damon on Highway 36 and when we got to the area where we first saw the bright lights we again saw the bright purple light on the horizon and the smaller blue light again appeared out of the larger purple light. After the blue light moved exactly like it did the first time and became stationary the lights floated in the air at about 8-10 degrees. We decided to leave the area because we figured that the object would start coming towards us again. We returned to West Columbia and told the City Judge of West Columbia, Jim Scott, about what we saw. Jim and his family went over to the area and remained for about an hour and a half but they didn’t see anything. I returned to the area the following 3 nights at approximately the same time and have not seen anything like what we saw the first night. 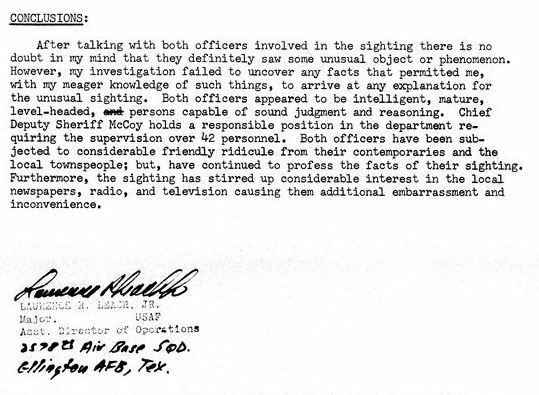 I have been unable to come up with any plausible explanation of our sightings. There are no ground lights in this area which could cause a reflection. 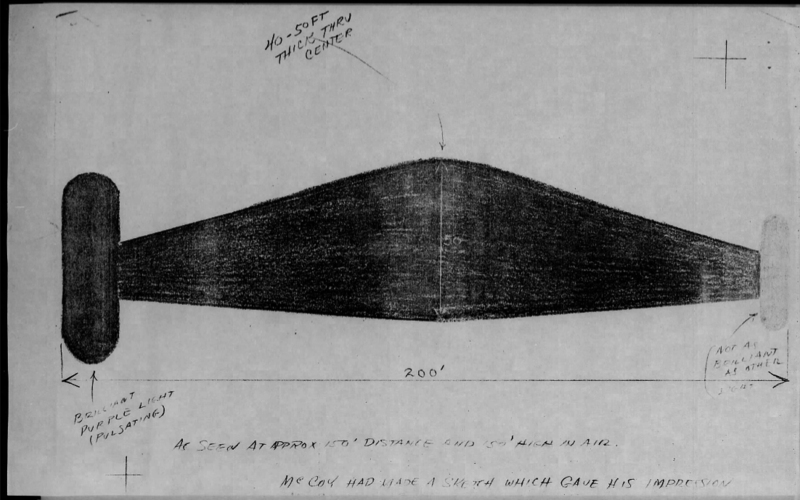 I am positive that the object was not any type of aircraft that I know to exist and I have never seen anything like it before. I have been a Brazoria County Deputy Sheriff for 11 years and now occupy the position of Chief Deputy Sheriff. I am 38 years old. Deputy Sheriff Goode has been with the department for 10 years and is 50 years old. Neither of us had anything to drink on the night we saw the lights and the object. We were working the football game at Sweeney on this night. The area where we saw the object is in Goode’s area of responsibility and we were on patrol duty. The night was clear and there were no clouds or haze. There were some spots of ground fog but not in the area where we saw the object.